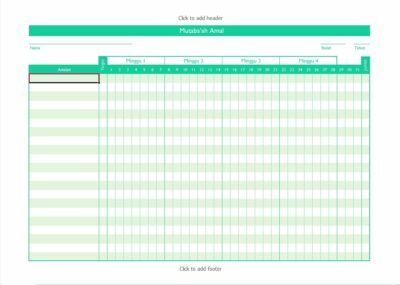 Excuse the Arabic and Malay jargon — I made this Excel spreadsheet that can be used as a monthly habit tracker or reward chart, and thought I’d put it up online for others to use. Chart your habits and build them up! The idea is that you can’t improve on something that you haven’t measured: so tracking your habits is one small effort into building your ideal daily routine. You can start by simply tracking good habits that you do, for instance “wake up at 5am”, “pray Dhuha“, “eat fruit”, “call Mum”. It is recommended to add on only 1-3 new habits per month because it is better to have few but consistent good actions. You do not need to use up all 21 rows! 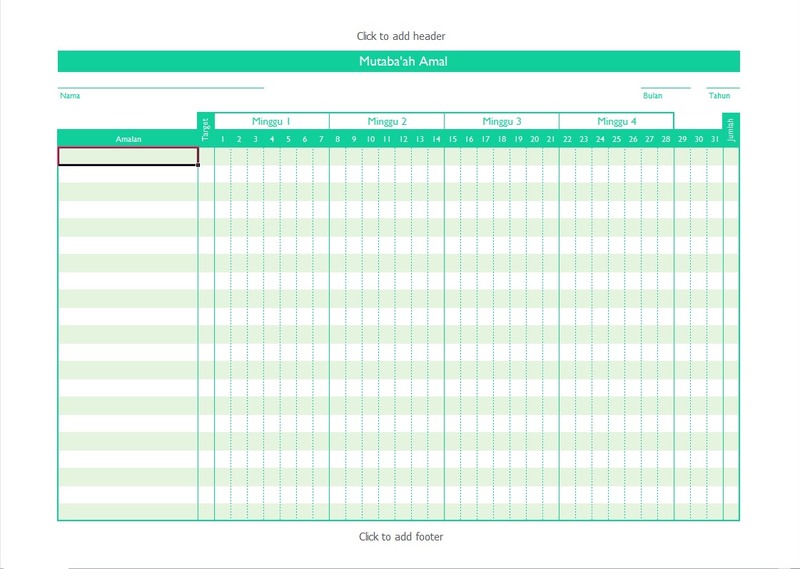 Set a target amount of ticks (or some people like to use Xs instead) in the beginning of the month. Leave the space empty if you missed the item that day. At the end of the month, count how many days you actually made it for each habit and total up in the last column. Reward yourself for certain goals, such as not missing a tick for the whole month for a new habit. I know, crucial point, right? 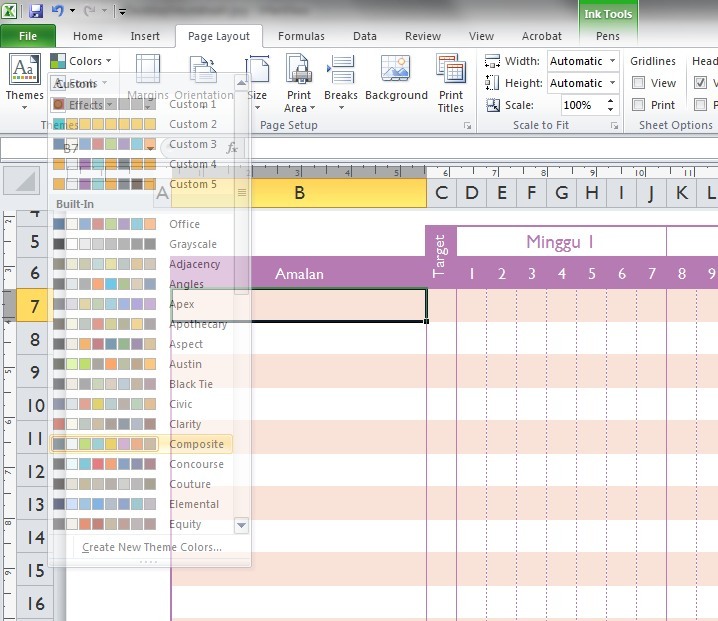 In Excel, go to the Page Layout tab, click the down-arrow next to Colors. Hover over the pre-selected choices of colour schemes to preview. Click on your choice to automatically re-colour the spreadsheet. Enjoy it! Feel free to share! You’re welcome. Salam, was looking for any downloadable mutaabah sheet and found your page. So i tried to download ur mutabaah amal sheet but the file was not found. If you dont mind can you email me at naaiemah.me@gmail.com thanks so much, may ur deeds be rewarded perpetually. I apologise for the broken links! >_< They have been updated above. I hope this works, thank you very much for letting me know. You’re welcome. And you too, ameen! Not at all, I’ve made good use of it myself so just decided to put it up online alang2 dah buat. Wa’iiyaki!